It’s hot, isn’t it? And dry. Very, very dry. Yup, that’ll be summer and even though we know it’s coming, it’s still rather a shock when it hits. Fortunately there’s a lot you can do to help your garden withstand the season. Let’s assume you’ve already done some work on your soil. If you’re on clay, you’ll want to have dug in lots of compost, gypsum to help break down the clay, and manure. The good thing about clay is that it tends not to repel water in the same way sand does, but once it dries out, you’re dealing with rock. If you haven’t improved your clay by now, leave it til there’s decent rain. If you’re on sand, you should still be able to dig it, but you’ll find water runs straight through it and no matter how many watering cans you empty onto a patch, the sand remains dry. Not good for plants. You’ll want to work on a smallish patch at a time, digging in Soil Solver/Sand Remedy, compost, manure and a wetting agent all at once. It’s expensive, but worth it. When you’re planting your garden, keep your plants grouped according to their watering needs. Some areas of your garden will need daily soaking, but others might cope happily with once-a-week attention. Make good use of trees for gentle dappled shade – plants labels that say full sun, rarely mean Western Australian full sun. 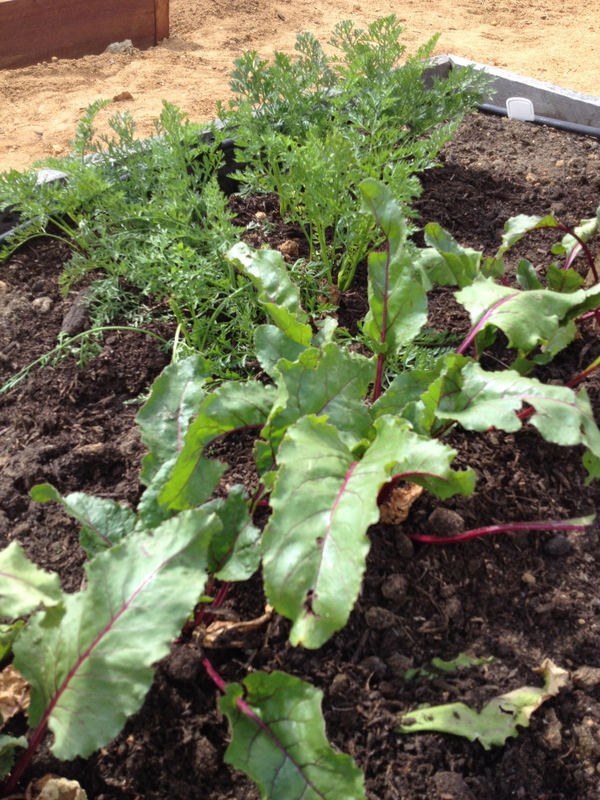 If you can shelter smaller plants, especially veg from the blistering afternoon rays, you’ll still get a decent crop. Deciduous fruit trees are particularly good for this. Likewise shadecloth can mean the difference between scorched earth and a harvest. The nurseries use white or beige year-round, but darker stuff is good for the nastiest of summer so long as you take it down as things cool off. Lastly – mulch. And more mulch. Pea straw is excellent so long as it you can stop it from blowing away, and you get bonus peas. If you use chipped up trees, put manure down first as the chip mulch will leach away lots of nitrogen from the soil, and that’s what you need for lush leaf growth. Be careful of find sawdust as it can set hard. Coffee grounds won’t stop a lot of evaporation but they will make snails and slugs think twice about snacking on your seedlings. Stay away from black jungle mulch (the black is artificial, sometimes provided by petrochemicals), choose coconut fibre for choice. And of course, choose your species wisely. 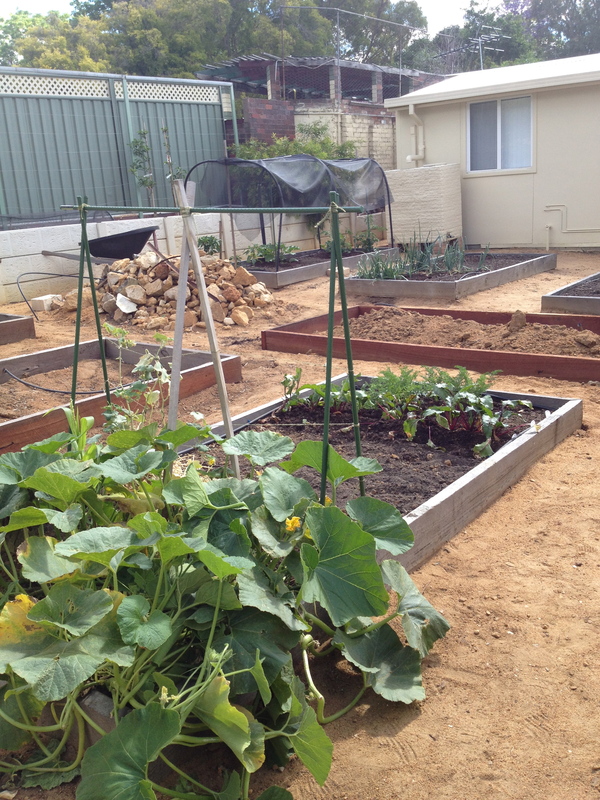 Tomatoes, capsicum, silverbeet, pumpkins, squash and melons thrive in summer. Wait until it cools off before you put in your potatoes, leeks, onions, herbs, cabbages, caulis, peas and lettuces. 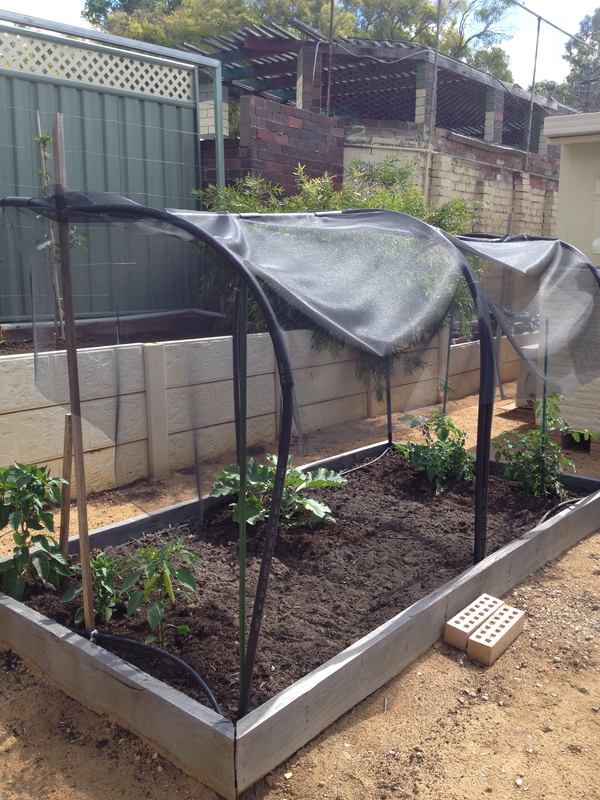 This entry was posted in Food, Gardening, Kitchen Gardeners and tagged Bentonite clay, Shade cloth, Summer gardening. Bookmark the permalink. As well as the premixed products mentioned above (e.g. Sand Remedy), you can also buy Bentonite clay in bulk 20 kg bags which does the same job. There’s a WA company Watheroo Bentonite (http://www.bentonitewa.com.au/index.php/bentonite-home-and-garden-domestic/sandy-soil-amendments) which you can purchase from Green Life Soil Co. in Midvale or Milne feeds Welshpool for serious volumes. I have been just watching your blog, It’s really Impressive. Just loved the information and content of this blog. Keep writing the stuff like this.